I was thrilled to accept the challenge! One Kings Lane is the leading new commerce company for the home, offering the best of top brands, vintage, and designer items at exceptional value. The challenge was to choose one of their beautiful mirrors and design a vanity that would reflect my style! Can I just say that the possibilities are endless! So many pretties to choose from! If you're interested in seeing more of their gorgeous mirrors head on over and see for yourself or Just click here! 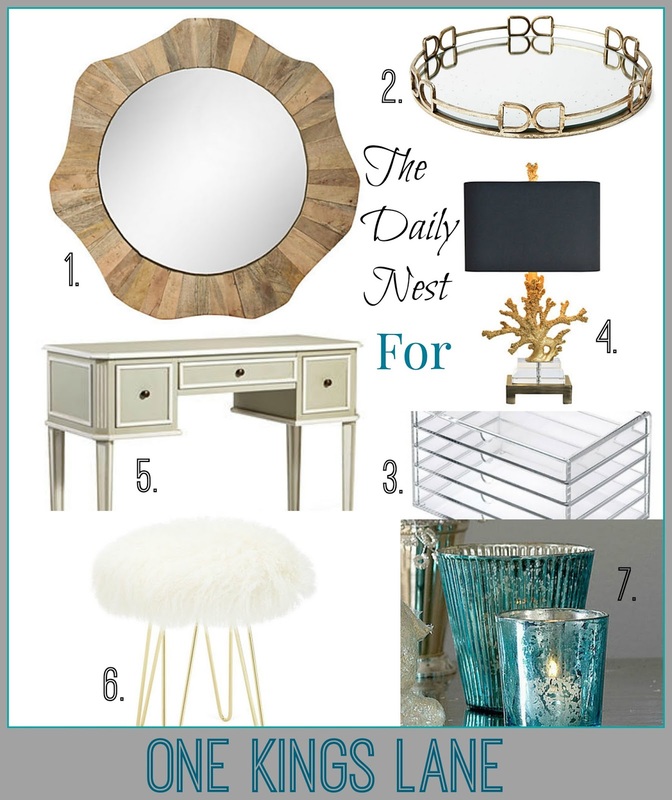 I chose the Lune Mirror for it's coastal feel which is totally my style. It's crafted from Mango wood and gives it that beachy vibe. The Avery desk is classic and functional with 3 nice big drawers which is essential for a vanity. Especially if you're a makeup hoarder like me! I love the mossy, gray finish trimmed in white. The look is classic and timeless. The Muji drawers (not from One Kings Lane but can be found here) are a fantastic solution for storing makeup out in the open. The clear acrylic makes finding your makeup a breeze. All while looking beautiful! Every vanity needs good lighting, but it doesn't just have to be functional it can be beautiful. Such as this Coral Table Lamp in gold. I chose this Deco Chain Tray in gold to keep everything organized while looking stylish. And last but not least to bring a little funk into this situation is this Curly Hairpin Brass Stool! There are no words to describe how beautiful this stool is. Topped with the wild, curly hair of a Tibetan Lamb. You'll feel like a real glamour doll sitting on this. So that's my virtual vanity. A mix of coastal and glam! A huge thank you to One Kings Lane for giving me this opportunity!